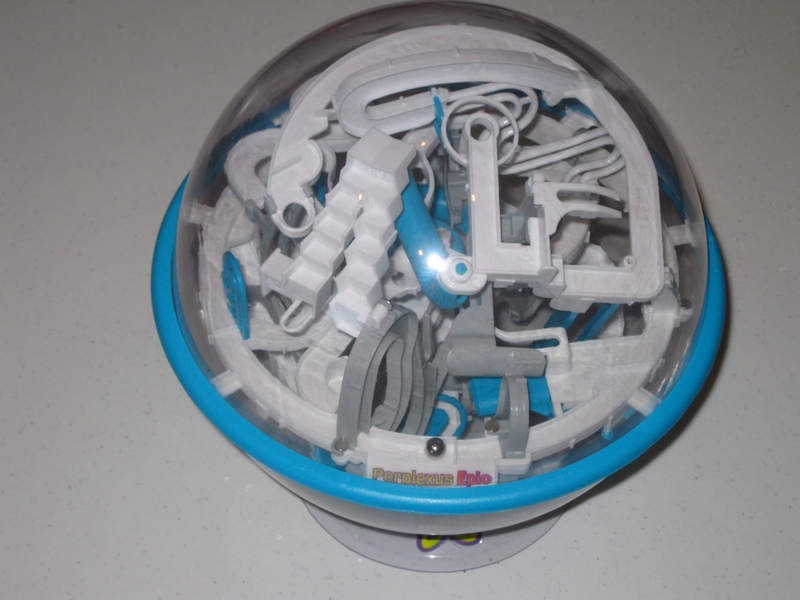 Yesterday I reviewed the Perplexus Rookie, and a long while ago, the Perplexus. Today it's the turn of the Perplexus Epic, the third in the series from designer Michael McGinnis. 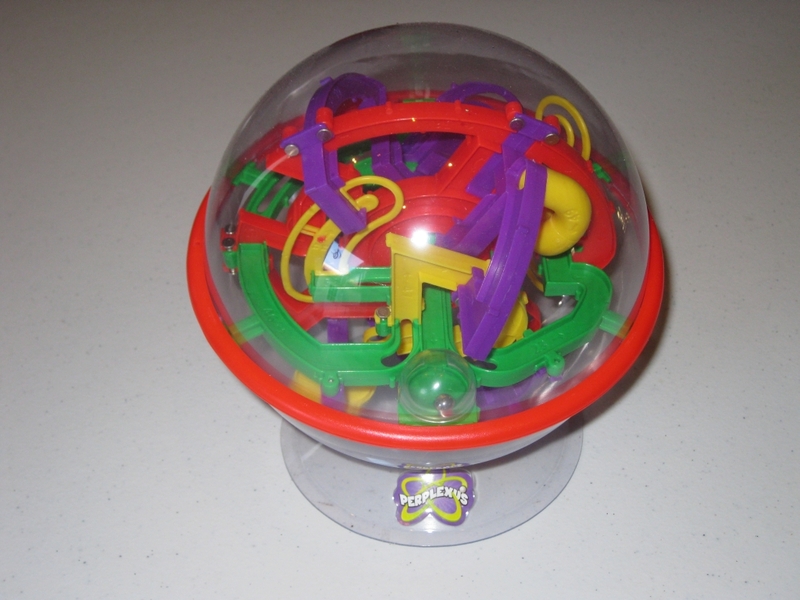 Given that my review of the Original Perplexus is regularly in the top five posts read on my blog each month if not the most read, clearly there's a lot of interest in the puzzles. 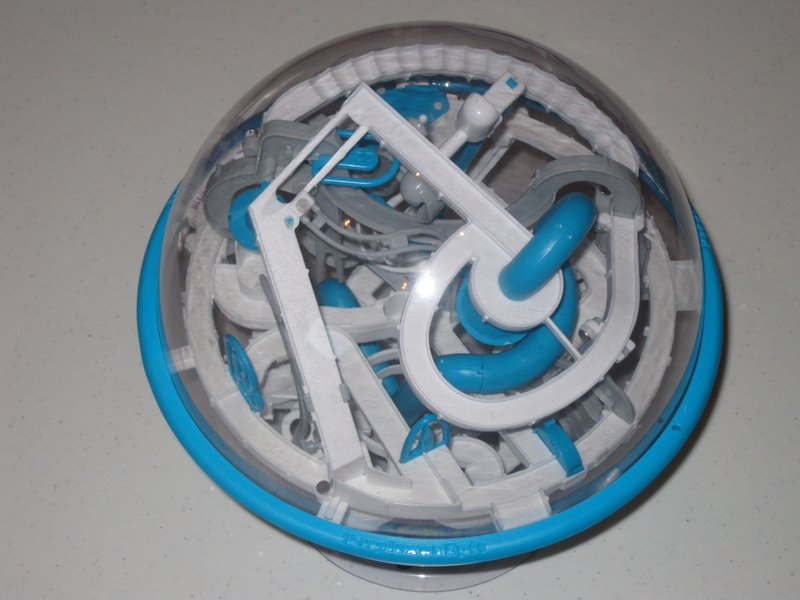 The Epic is the hardest of the series of Perplexus puzzles, covering 125 stages from start to finish. With four starting points, this time labelled as Practice A, B and C (along with the actual start) this is a serious challenge, and completing the track from the first stage all the way to 125 is a serious dexterity challenge. The Epic is larger than the original Perplexus at 8" in diameter and really is a step up in difficulty. Sticking with a much sharper White, Blue and Grey colour scheme, it certainly seems as though this edition is no longer aimed at the younger market, but at the serious puzzler. It certainly looks good sitting on the top of my puzzling shelves. Ok, so it's the book shelves, that just happen to have puzzles scattered over them as well as the books. Having spent quite a while trying to make it from the start to the end in one try, I can confirm that this is not an easy puzzle. There are many more moving elements in this edition, with more hump backed bridges, stairs, single walled tracks, drops, tunnels and jumps than either of the other puzzles that you're not going to make it through this one without some serious practice. When I first started trying to solve the Epic, I had real difficulty being able to get beyond the fifth section - the fourth being a see saw which has a drop at the end of it meaning you have to get the speed just right or you'll miss the landing. And that's not the most challenging obstacle in the puzzle. One of the new challenges I found in the Epic is just finding an angle to be able to see the ball and the current stage of the puzzle at certain points as there's so much going on in there it's not always obvious how to hold the ball to get the best view to be able to progress, and you're going to have to be able to see where you're going if you hope not to fall off. The Epic really lives up to its name as a seriously challenging puzzle, that you're going to get a lot of hours of play from. That is if you don't throw it across the room in frustration. While I don't recommend throwing it, I really do recommend picking up a copy. Amazon and Puzzle Master both carry the puzzle for a very reasonable price so you really can't go wrong. Finally, let me wish all my readers a Merry Christmas. I hope Santa has been good to you and brought you many new puzzles to keep you busy through all the food that's sure to fill you to the brim. 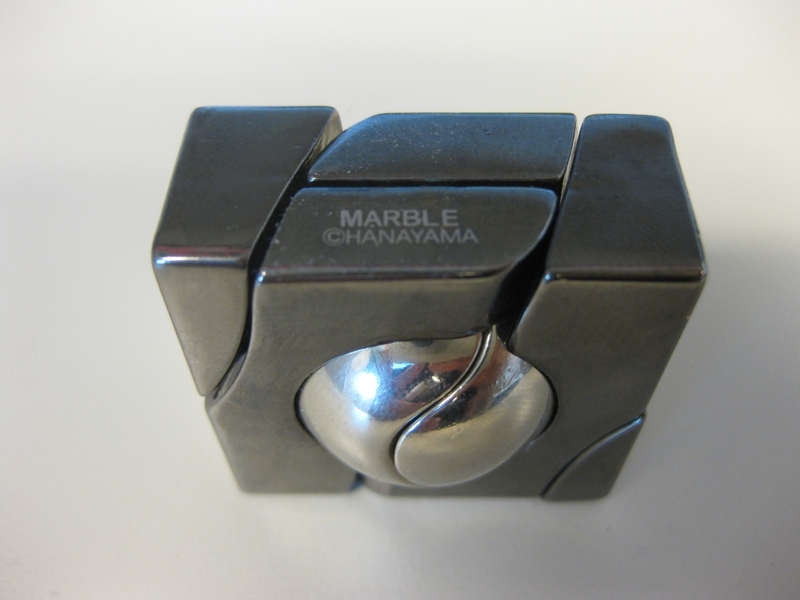 Cast Marble is another puzzle from the Hanayama Cast Series of puzzles this time, designed by Oskar van Deventer and Bram Cohen. The goal of the puzzle is to take apart the four pieces, and put them back together. Thanks Puzzle Master for sending me this puzzle to review. As you can see this is another great looking puzzle with contrasting colours of anodised/chromed metals used for the body and the marble. At 1.5" x 1" deep it's not a large puzzle, and as Brian already pointed out in his review the darker body of the puzzle really shows fingerprints well, so if you're like me, you'll find yourself reaching for the cleaning cloth to keep it print free. Given that it's a solid metal puzzle, it has a good weight in your hands, even with the size being quite diminutive. As we've come to expect the puzzle name, and Hanayama logo are laser etched into the top of one of the pieces, just in case you forget which puzzle you're playing with. As much as I'm joking about it, it really is a nice touch, and something I'm happy to see Hanayama doing. Straight out of the familiar black and gold Hanayama packaging, you'll find that the puzzle wants to move into the position you see above. This seems to be the natural movement that you'll find when you start playing. As you might have guessed it's not going to help you to solve the puzzle, but it might let you see each of the parts a little more clearly. 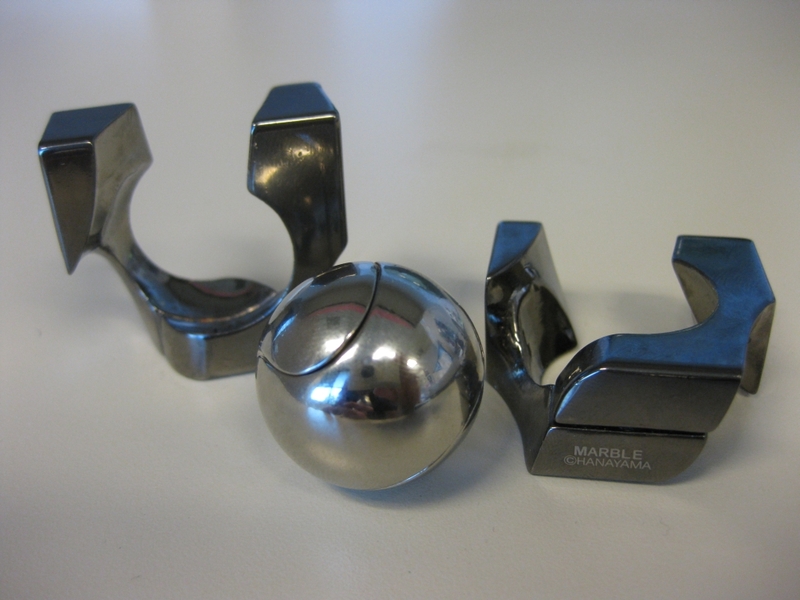 The silver ball in the centre of the puzzle spins freely inside the frame pieces, and this is helped given just how smooth the finish is on the puzzle. Given the puzzles small size, and how slick the surfaces are, it does add an extra challenge to the puzzle. I found that even once I found out how to take the pieces apart, manipulating the pieces was still challenging. 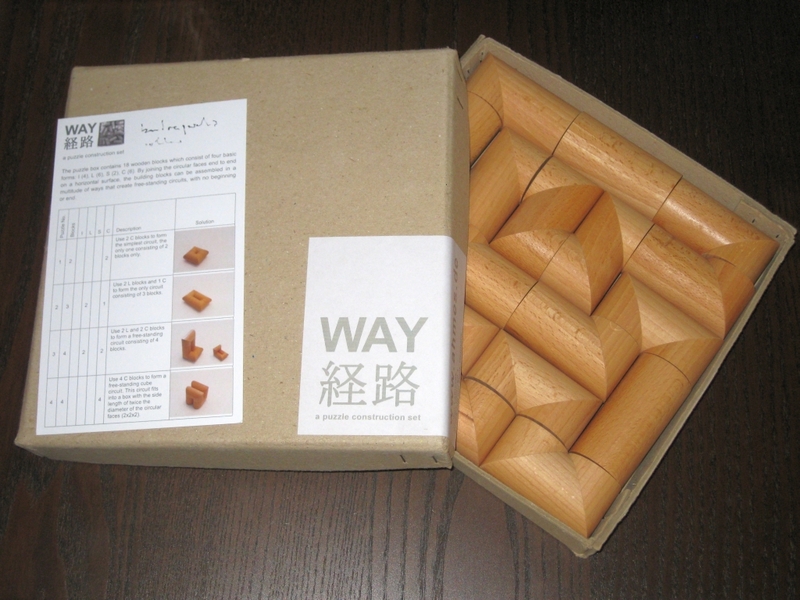 Rated as 4/6 on the Hanayama scale and 8/10 by Puzzle Master (their scale starting at 5), this is a challenging little puzzle. I spent 15-20 minutes to figure out how to take it apart for the first time. When it started to come apart, the two frame sections stuck against one another as they were separating, leaving me thinking I wasn't solving it correctly. It turns out that a small adjustment to the positioning of the four pieces, and they slid apart very smoothly, with a very satisfying motion. Much like the Cast Loop puzzle, the movement of the pieces as the puzzle comes apart is almost hypnotic, and its a very graceful thing to watch come apart then slide back together. Once you have the pieces apart, the twisted shape which leads to this unusual motion is revealed. If you take care when opening the puzzle, then re-assembly shouldn't be too difficult, but as is the case when taking it apart, precise alignment is required. I found it easier putting the pieces back together than taking them apart, mainly because it seems to need less dexterity, and also that the puzzle doesn't want to rotate in the horizontal axis around the ball (like you see in the second image). I think this is a reasonable challenge, and will keep most people puzzled for a fair while. More seasoned puzzlers may figure this out faster, but the movement alone makes it worth adding to your collection. 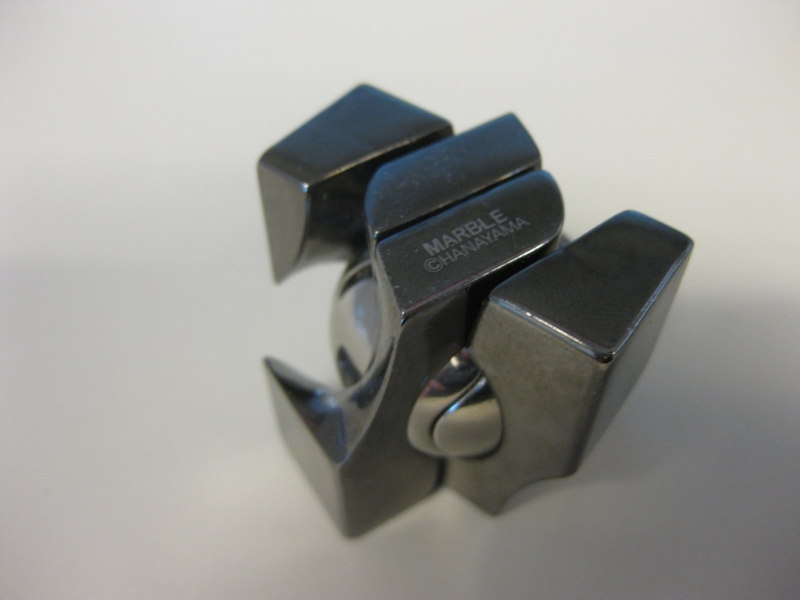 I highly recommend Cast Marble, and it's probably second only to Cast Loop in terms of my favorite Hanayama puzzle at this point. If you don't have this already, definitely consider picking up a copy. Oli has also written about the Cast Marble, so to read his thoughts, head over here. While browsing the Puzzle Master store, I came across this interesting puzzle by Russian inventor Vladimir Krasnoukhov. The Puzzle is a variation of the classic fifteen sliding tile puzzle however instead of trying to create an image or sequence of numbers, you play with light. Thanks to Puzzle Master for sending me this puzzle to review. Svetnashki Optical Puzzle in the bag it arrives in. The idea behind the puzzle is quite simple. 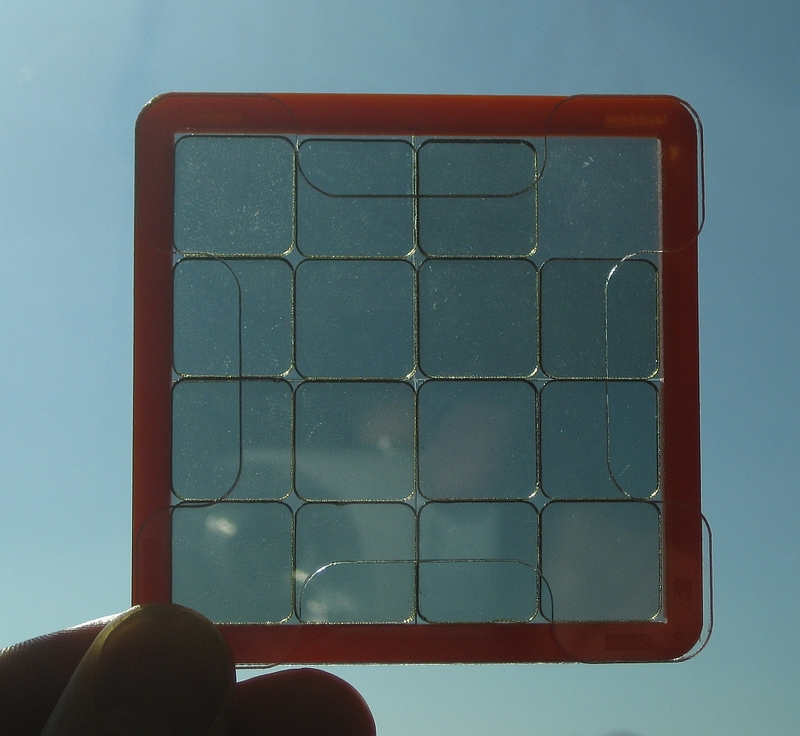 Using perspex which has been polarised either up/down or left/right, an invisible grid is formed. 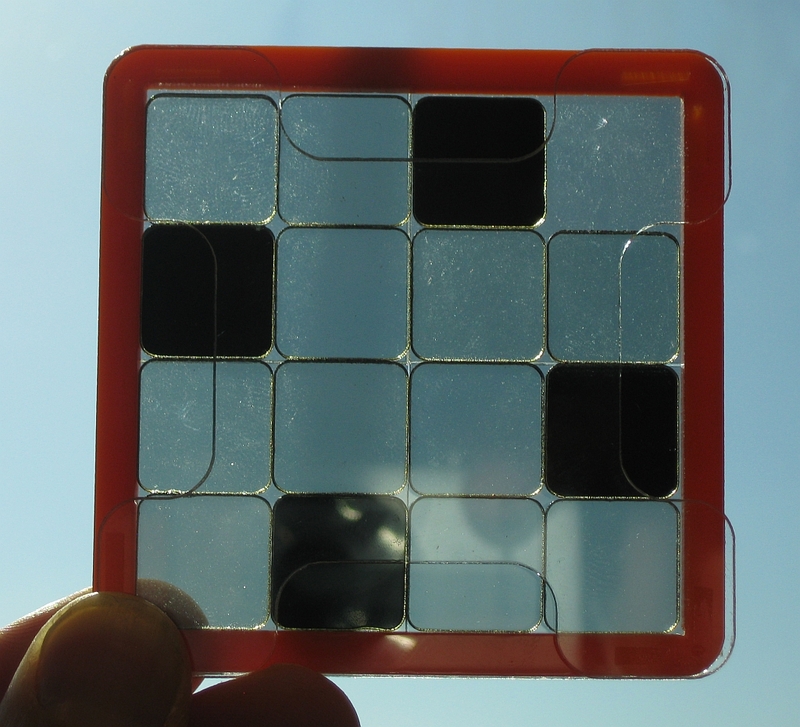 The back of the puzzle is a 2x2 grid where each alternate quarter is polarised differently, and then the fifteen 1x1 sliding tiles are polarised in alternate orientations. 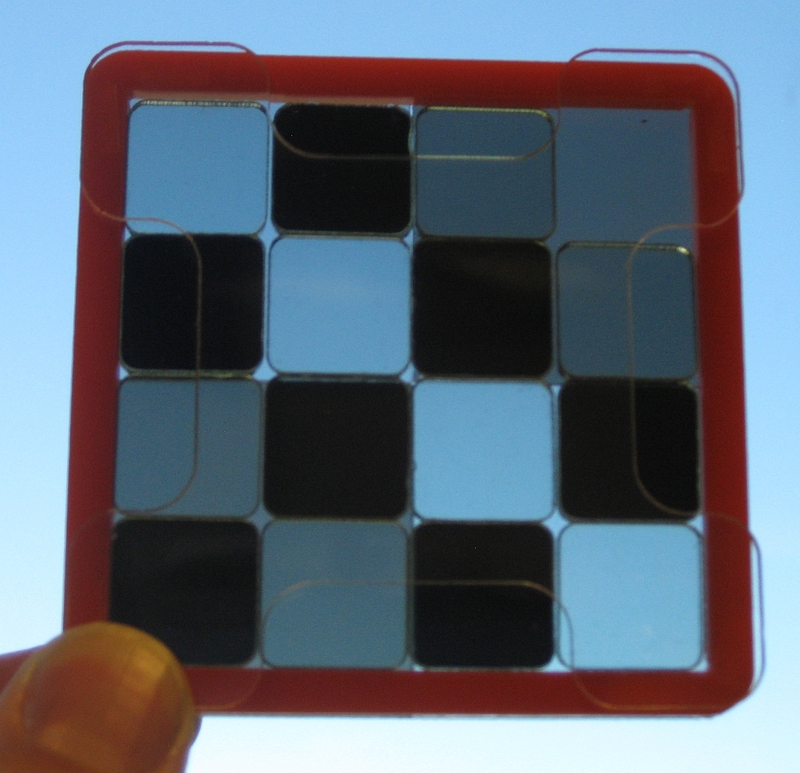 As the pieces slide across the back grid, their colour will change from transparent to opaque. The challenge is made somewhat more difficult due to the top sheet of perspex which holds the pieces in place but also restricts your ability to touch any of the corner pieces and the four centre pieces. As a result you have to tilt and rotate the puzzle to move the pieces around instead of just pushing any individual piece where you want it to go. 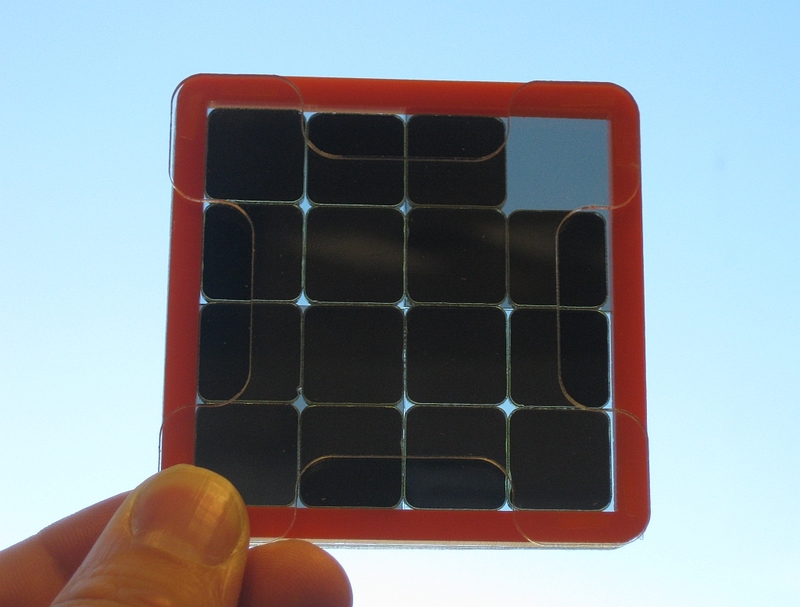 It's a nice idea, and the pieces move around freely enough that you don't feel frustrated. 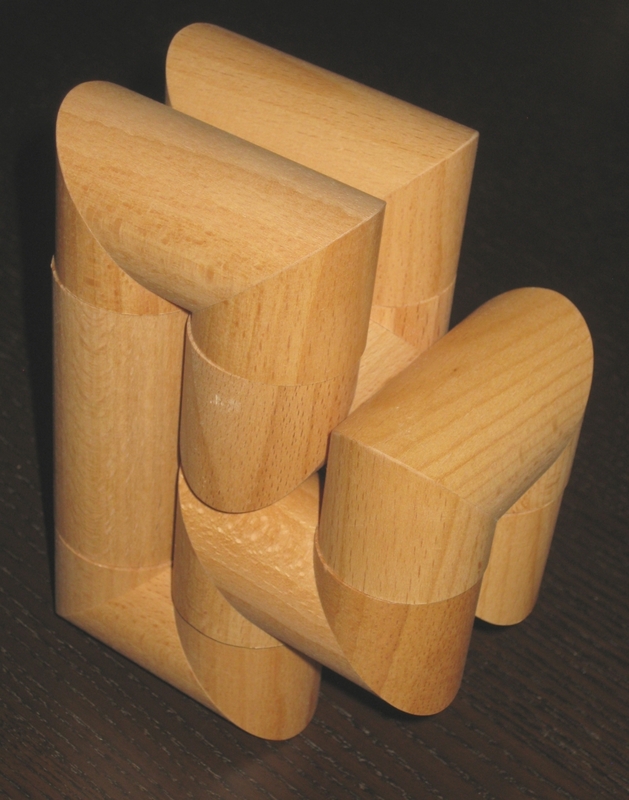 Given the nature of the puzzle, there is more than one 'solved' state possible. You can make the puzzle entirely clear or entirely opaque, there really is no right or wrong answer, and as such it gives it far more flexibility and replay value than a standard sliding tile puzzle with a fixed picture printed on the surface. Add to that, the ability to create as many patterns using the light and dark as you care to imagine, and the possibilities, while not endless are certainly large. Creating the checker board pattern on the right is just one example, but there are many more just waiting to be discovered. Puzzle Master rates the puzzle as a Level 7 - Challenging (out of 10), however I don't really see it being quite as difficult. Perhaps the amount of fun you can have with this puzzle makes it seem less difficult. I was able to move between each of the solved states in a few minutes, and was able to create a number of simple patterns quite quickly as well. To my mind this is a case where fun outweighs difficulty and is less important. Puzzle Master sells a number of colours including both the larger and smaller versions of the 4x4 puzzle and the double layered version, you can order different sizes and custom colours from the manufacturer directly. 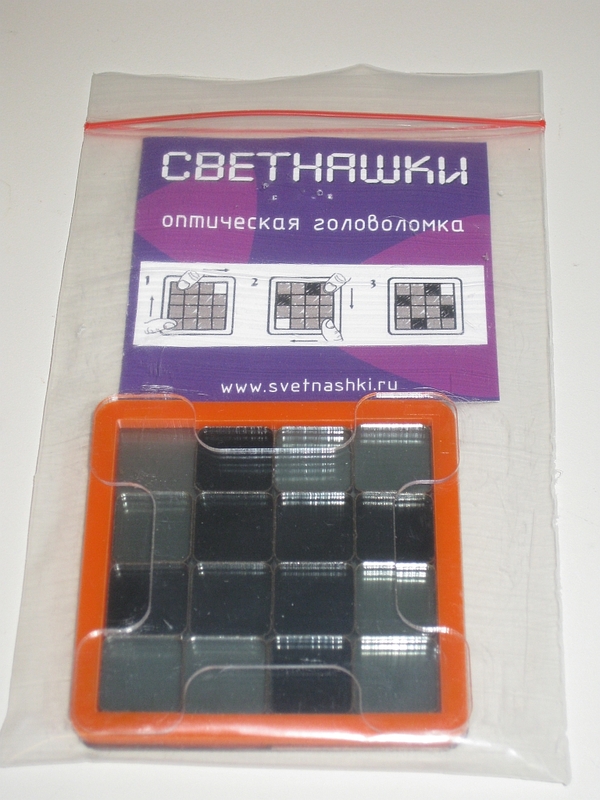 Svetnashki Optical Puzzle On their website, they have 4x6 and 6x6 versions available if you're looking for an added challenge, or to be able to create more patterns. Overall, this is an excellent little puzzle/toy and I highly recommend it for all ages and skill levels. I've had a lot of fun just randomly spinning it and seeing which patterns are created. While I'm not normally a fan of sliding tile puzzles, this one really has caught my attention, and I have to say I really enjoy playing with it. 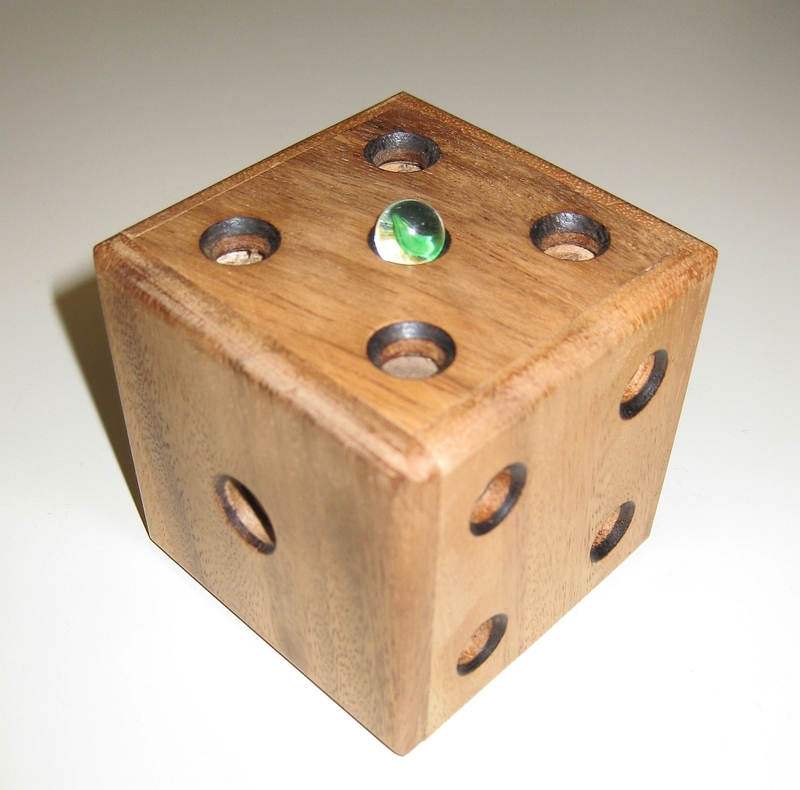 Magic dice is another Puzzle Master designed and built wooden puzzle, where the object is to remove a small marble from the inside of the dice. Thanks Puzzle Master for sending me this puzzle to review. 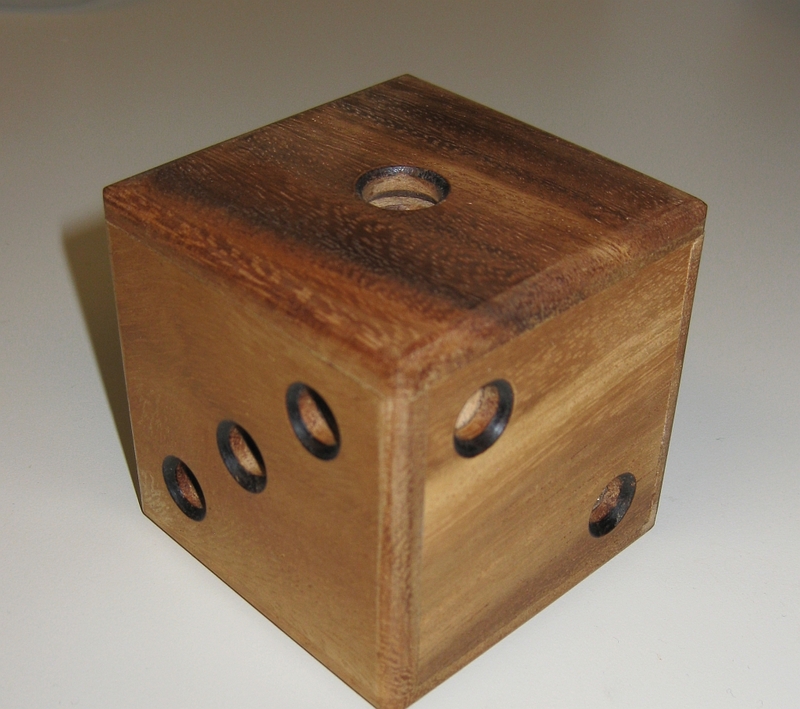 The 2 4/5 inch cube is made from Rubberwood, and has countersunk holes on each side corresponding to the faces of a dice. As far as the magic part of the name goes, I have no idea where that came from. Inside the cube, a small marble is trapped, and runs along tunnels, forming a sort of simple maze. By looking through the holes in the sides, and tilting and turning the puzzle, you can navigate the marble through the maze until it can be removed through the side with the single hole, which is slightly larger than the others on the cube. The outer cube is well finished, and looks great. The inner 'maze' is a lot rougher, and the finish of the wood isn't as high as on the outside. Getting the marble to that side is a reasonable challenge. There are no internal stops on most sides of the cube, so it's easy to have the marble run from one side of the cube to the other, without pausing anywhere in the middle. A gentle hand, and the occasional 'hop' is required to coax the marble to where you need it. There is an added challenge by not being able to see through the puzzle on all sides. Given that the holes represent a dice, there is no visibility in the centre of the puzzle on the #4 side for example. Puzzle Master rates this is a level 5 puzzle (easy) and I'd agree. It's not a tough puzzle, but can be a little frustrating as you watch the marble speed past where you wanted it to stop. I took around five minutes to remove the marble, and I suspect most people would be the same. Overall a fun puzzle, just don't expect it to keep you entertained for hours.